We’re going to start treating you a little differently this year. We’re not changing the place we’re taking you to, but we are revamping how we’re getting you there. As far back as 1878, two years before ASME was incorporated in 1880, the Society’s founding fathers—along with the first of my six predecessors as editor—conceived and began publishing what later, in 1919, became Mechanical Engineering magazine. Published for ASME’s illustrious membership, the magazine through the years was read by technology giants such as Thomas Edison and Henry Ford, to name only two. The focus then was on mechanical engineering and allied technologies. It still is. But mechanical engineering is changing. It is stretching its traditional boundaries. It is becoming interdisciplinary and gaining influence. This is apparent in the broad reach and influential global role ASME has taken on. Today, ASME and its members focus on areas ranging from defining sustainable energy solutions to enhancing the engineering workforce pipeline; and ASME’s influence in the standards world remains largely unsurpassed. 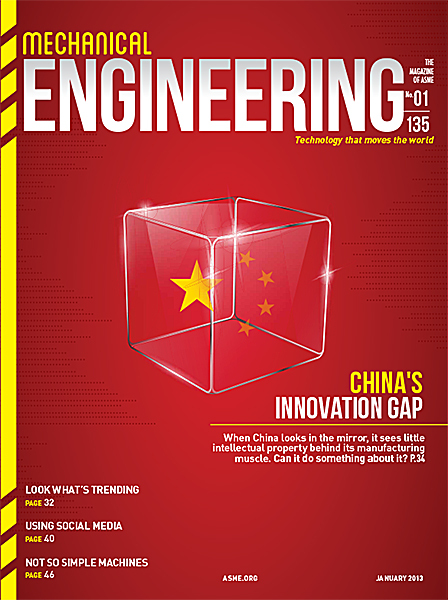 Grounded on the authority we derive from being published by one of the pre-eminent engineering organizations in the world, Mechanical Engineering will begin placing a greater focus on trends and on general engineering and technology content, but as seen through a “mechanical” lens. To that end, our talented and knowledgeable staff will continue to generate and curate content that is relevant and also thought provoking, but we’re adding a few new twists. We hope to be aspirational as we provide you context for leading edge technologies, and we believe that our new graphic design you are seeing with this issue indicates that. We’re adding new voices to the magazine through monthly columnists who are leading thinkers in their respective areas; and we’re giving you a platform so others can hear your own voices too, as we now invite you to send your comments for publication as well as your letters. Our new One-on-One section will spotlight some of the technologists we think you should get to know a little better. This month we feature Dan Mote, who is president nominee of the National Academy of Engineering. Trending, which takes a numerical approach to telling a story, is another new section that we believe will become part of our signature and that you’ll look forward to each month. I’ll let you discover the rest of what’s new on your own. We’re also rededicating ourselves as a strong complement to ASME.org: we give you more long-form journalism, to our part-ners’ more short form on the cyber side. Together, along with EngineeringForChange.org, we are becoming a prominent digital content platform committed to helping lead the global engineering conversation. We value the trust you place in us to help guide you through the exciting evolution of technology and its growing influence on government and on the world’s economy. Join us on the ride as we discover new technologies, new ways to positively impact the world, and as we look in on some of those who are leading the way. The time has never been more exciting to be an engineer. We hope that your re-imagined magazine reflects it..